Blair Witch Project meets Cloverfield is handled really well, and given an interesting story that turns very dark in its second half. 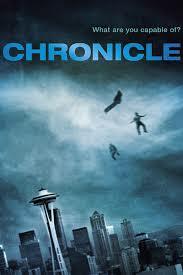 Chronicle is a really cool take on the superhero genre. It’s a movie that is meant to take the Blair witch perspective, (which means hand held cameras and only seeing from the point of view of the person filming), and to use that to help the movie feel more realistic. For a large portion of the film, this kind of works. The movie does have a unique, first person feel to it. Andrew is the main character, and he buys a new camera, and starts filming everything. He brings it to his high school and just films in the halls. Of course he makes a lot of enemies this way. One night at a party, Andrew and his cousin, matt, along with their friend Steve (Wallace from The Wire! ), end up walking outside to check something out. Steve and matt have found some kind of hole in the ground and are planning to go over and explore it. But first they get Andrew to join them with his camera. The boys end up going down into the hole, and what they find there is pretty neat. I love the way the visual of whatever it is that they come across, is handled with all sorts of lights and close up imagery. When they get out of the hole, the boys start realizing that they can do things. We don’t really get to see the moments that they realize this; because the idea to the movie is that we only see when they turn on the camera. We see only what they are filming. So when they realize something they have the camera off, but then when they decide to get it on tape, that’s when the camera comes back out and that’s when we get to see it. This is one of the few flaws of the movie. It would have been nice to witness the first moment when they realized something cool that they could do. But we are certainly there for all of the tests. These guys can move objects with their minds. They go into a large retail store and start messing around with the customers. They even move a woman’s car from one parking spot to another. And every time they use these powers, their noses start bleeding. For a while, all of this is a lot of fun. These guys have great, extreme reactions, screaming and shouting about how cool everything is. And the point of view camera approach, where you never see the person who is supposedly holding the camera, works really well. And then it’s time to take things to the next level. The boys learn that they can fly. They use this to dive through the clouds and play football up there. And one day while on the road, a car comes up behind them and starts honking. Andrew swipes his hand through the air and the car goes flying off the road and down into a ditch. The passenger ends up in the hospital, and for the first time we see that there is a dark side to our main character. Granted, he didn’t mean for all this to happen to the car, but once it does, something frightening is sort of awakened. From very early on in the film we see that Andrew has a disturbing home life. This is another way that the movie tries to keep things feeling dark and realistic, the whole way through, instead of everything being bright and sunny and simple problems. Andrew’s mom is dying and has tubes running all over her body, including into her nose. And his dad is abusive. In one scene early on, Andrew’s dad runs into the room, throws him out of his chair, and beats him. The movie gets darker and darker as it goes on. One of the main characters dies and the movie then becomes about the two guys who are left. One of them is good, and the other is bad. In a way, it becomes a little too simple. And even when Andrew is not the one filming the scenes, we still get the watching-through-someone’s-camera angle. That’s because matt is dating a girl who films everything for her blog, and so as long as we are with either her or Andrew, the movie is able to use this approach. I like the clever way they found of presenting this and giving us a reason to be watching the scene through a camera. The movie works because it moves nice and slowly over all of the boys’ tests and discoveries. I loved the way iron man carefully showed us the way tony stark designed every aspect of his suit, and chronicle really takes the same approach. Half of this movie is spent on the boys experimenting with their abilities and it’s a great half, filled with cool ideas. I would have liked to see them mess around with some of the hot girls in their school a little more, making clothes fly off or something. There is a quick moment where they grab a leaf blower and blow a girl’s skirt into the air, but it’s not enough. Not if the movie is trying to be realistic. The movie does build to a pretty intense climax at the end, involving all kinds of police forces coming out to stop a problem. And we get a lot of shots from the point of view of helicopter cameras, which is also pretty neat. While the film might lose our focus a little bit here and there in the second half, it certainly gets it back by the ending, and finds it’s way to give us a cool climax. 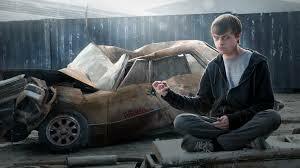 Chronicle is a very good movie. It’s a short film (slightly under an hour and a half), and that’s a good thing. This is one of those movies that know exactly how long it needs to be and doesn’t try to waste time filling more screen time than is necessary. There’s a great initial idea here and the filming style works out nicely. The thing about the hand held camera, point of view perspective method of filming is that while it does put the audience into the moment, it also makes things a lot harder to follow. Which means the movie has to work twice as hard to make sure we are keeping up. For the most part, this movie does a good job with all that. It really presents the picture of what it would be like to be a superhero, having the kids demonstrate their skills in the school talent show, during a game of beer pong, or by yanking out the teeth of a kid who insults them. The movie gets very dark in it’s second half, and loses all of that fun energy it had going on, but it is still very cool and creative.